I sleep around 2:30am earliest EVERY SINGLE NIGHT! That's why concealers are my bestfriend for the past few months and I recently found a good one called Kate Cover Concealer for Cover. The shade NB is perfect for the undereye area and after the jump, you'll understand why! Left side facing you with a thin layer of Kate Cover Concealer for Cover in Shade NB. Right side facing you is my Bare Face in all its glory! I recently shared on Snapchat how I love this concealer but kept it a secret until today because I need to test this a couple of times before I share my seal of AMW Approval! Housed in a tiny pot that is handy enough to tote along EVERYWHERE you go! This packaging reminded me so much of my past "Mineral EyeShadow pots". The shade NB also known as Natural Beige is a perfect under eye concealer because of the presence of orange tint. For your information: Production Date, Batch Number, Ingredients well printed at the back. As for application, I highly recommend dry-skinned users to apply a good amount of eye cream , let it set for a couple of minutes before you apply on the undereye area to prevent creasing and tugging. For the rest of the gals who has normal or oily skin, you can apply the cream directly after warming it up at the back of your hand or between fingers. The texture is not too soft or hard, it is just right to stay put on the area applied until removal (if set properly with powder). Application tip: Dab a good amount and blend out harsh edges with your fingertips or concealer brush. Overall, the Kate Cover Concealer for COVER is indeed a great coverage concealer! You can work your way from medium to full coverage. The not-so-good-news is, the fact that the concealer itself "on pot" is extremely thick and dry so a little bit of warming up and adding a bit of eye cream or moisturizer may do the trick BUT, at the end of the day, the concealer may creep into fine lines especially if you have MY type of skin that literally "drinks up" all moisture. I don't worry much though because I have a handy eye cream inside my bag to restore moisture on my undereye area anytime of the day. I highly recommend this concealer to users with normal and oily skin as this will help cover AND mattify the area around the eyes. As for the rest of my face, I prefer stick concealers for spot concealing but you may feel free to pick this one up if you plan to cover larger areas like acne marks, pimples and freckles! 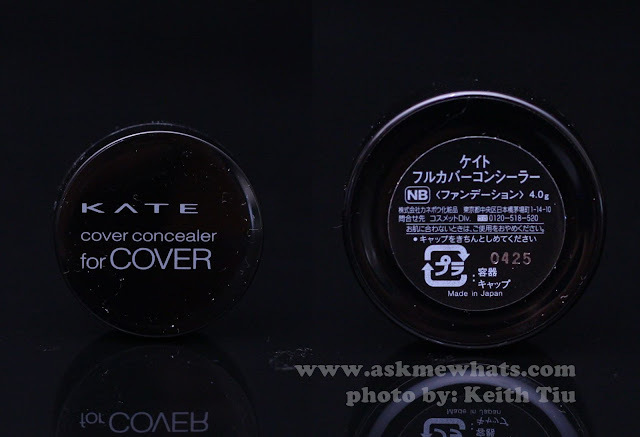 Kate Cover Concealer for COVER comes in 2 shades: LB (Light Beige) and NB (Natural Beige). Available at Kate counters at selected SM Dept/Watsons stores, Wellworth UP Town Center, The Landmark (Makati and Trinoma) and at Metro Gaisano Cebu. Also available online at Zalora priced at Php650.00 each. Have you found your ultimate undereye concealer? first time to heard about KATE product! And as on your reviews, really looks great! did you already tried other kate product aside from concealer? Perfect!!! Luv it"!!! Ask ko lang po if pwede din po ba yan gamitin to cover my pores? Hahaha my auntie toss this out I won't tell (evil grin) (as if I can bear hiding it) she only needs an eye cream to work this out! hahahahah go ahead! Ibalik ang tamis ng pag ibig sa Kate concealer na to!